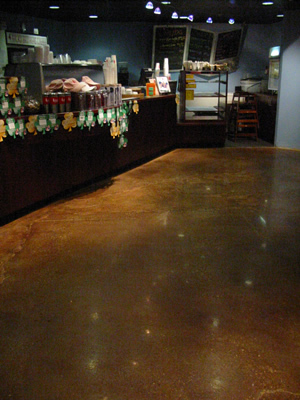 The beauty and depth of color achieved by staining polished concrete is comparable to fine marble, granite, ceramic tile and terrazzo. The color options and pattern combinations are limitless. All colors from natural brown hues to colors of the rainbow are available. Our services include consultation and custom stain mixing. We have the skills and knowledge to create natural stone patterns, distinct detailed artwork and fine logos. Staining concrete is a non-toxic, non-polluting process that leaves you with a clean, beautiful, colorful and permanent surface. 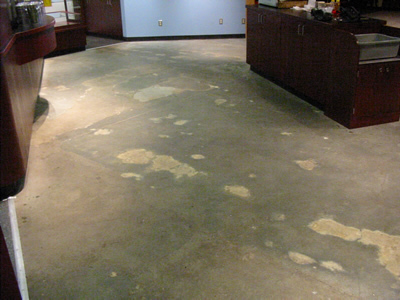 Staining is a reactive process so, the color becomes part of the concrete which means it cannot wear off. This is a wonderful feature especially for logos and high traffic areas. Unstained floor. Sometimes they can be blotchy and unattractive. Same floor, stained. Our talented staining artists can even out color and create a beautiful, warm atmosphere. We don't just stain and walk away, we work with the floor until it is a thing of beauty. This is a mahogany stain.